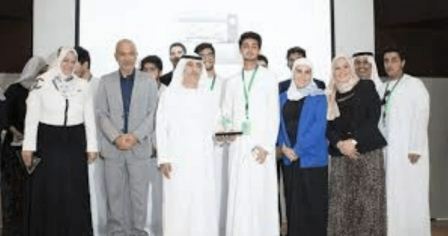 Ten student company teams from Emirati schools were shortlisted to take part in an entrepreneurial competition organised by Injaz UAE, one of the world's largest non-profit business education organisations, in partnership with Tejar Dubai. The contest saw next generation of young entrepreneurs and school students challenging each other and the audience as they competed for the top "Student Company of the Year Award 2018". Students transformed their classrooms into start-ups with the help of corporate volunteers from the business community. As part of the programme, students learned how to set up and run their own business over 24 weeks, allowing them to acquire real life skill and attitudes needed for their future. The awards ceremony was held at the Dubai Chamber of Commerce and Industry on Thursday. The competition wrapped up with the Company of the Year award being presented to students from Dubai National School Barsha for their innovative smart parking idea. Student Abdul Aziz Ali, CEO of Smart Parking project idea, told Khaleej Times: "We invented an online booking parking service. If you have a meeting after a few hours and you are worried that the parking of that place will be full by then, you simply can use our Smart Parking app. You need to download the app, go to booking section and put in your name and a picture of your number plate. When you will come to the parking area at the specified time, the barrier on your reserved parking will have a camera that will recognise the number plate and open. You can set the hours or even extend it. We are also looking to sell this idea to the government to use this app for people of determination." Dana Hindi from DNS Twar school was presented with the CEO of the Year, and students from DNS Twar won the Best Social Impact award for their project, La Securitie. Explaining the project, Hindi said: "Our project focuses on bus safety. There have been many incidents in which children are left alone in school buses and to prevent potential injury or abuse, our project La Securitie was built to be installed in buses. It will automatically count the number of students that enter and exit the vehicle. This will be done through light, laser sensors, and a touch screen manned by the driver. The technology behind this is called Raspberry P1" and will ensure that the number of students are always accounted for." Judges included Essa Zaabi, senior vice-president of the Dubai Chamber of Industry and Commerce; Leigh-Ann Judd, director of corporate communications, Honeywell Middle East; Shamsa Al Falasi, head of CITI Global Subsidiaries Group, UAE and Iraq; and David Scott, president Exxon Al Khaleej, Abu Dhabi. Hisham Abdullah Al Shirawi, vice-chairman of Dubai Chamber of Commerce and Industry, described the competition as a great learning experience for business-minded students who are keen to learn essential skills that will prepare them for a fast-changing job market. INJAZ UAE's private sector volunteers included members from CITI who mentored students over a 15 week period to help them conceptualise a business idea, raise capital, manage their student-led start-ups, then liquidate to experience the entrepreneurial life cycle.